CMI’s Trivia Quiz - Credit Mediators Inc. Which group of people developed the first cheques? The ancient Romans are believed to have used an early form of cheques known as praescriptiones in the 1st century BCE. During Roman times, temples doubled over as banks in which many adherents put their gold, silver and valuables for safekeeping. When one person owed another, they wrote out a praescription instructing the temple to pay to that individual by parceling out coins and valuables accordingly. Beginning in the 3rd century, financial entities that resembled banks in Persia began to issue letters of credit. These letters were termed čak, meaning “document” or “contract.” The čak became the sakk later used by traders in other Arab-ruled lands. Carrying a sakk was without question more secure than transporting coins and valuables, which could be easily stolen along treacherous trade routes. In the 13th century in Venice the “bill of exchange,” which is a type of cheque, was developed as a legal mechanism to be used as payment for international transactions, again without the need to carry large amounts of gold and silver. Their use subsequently spread to other European countries. By the 17th century, cheques, which were also called, “drawn notes,” enabled a customer to draw on the funds that he or she had in their account with a bank and required immediate payment to the payee. In America, the Bank of New York, after its establishment by Alexander Hamilton in 1784, began issuing cheques. 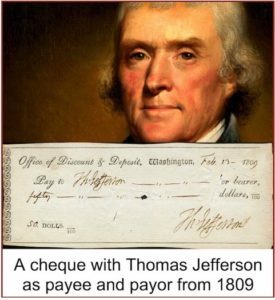 The oldest surviving example of a complete American cheque book from the 1790’s was discovered by a family in New Jersey. The documents are in some ways similar to modern-day checks, with some data pre-printed on sheets of paper alongside blank spaces where other information could be hand-written as needed.